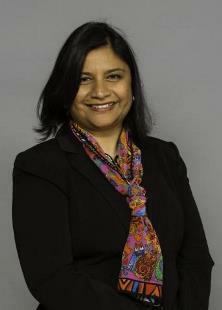 Professor Laxmi Ramasubramanian, Hunter College, recently completed her term as President of UCGIS and is now serving the organization as Past President. Professor Ramasubramanian has tirelessly served the organization during a time of restructuring and renewal. Professor Ramasubramanian has also served UCGIS as Secretary, a member of the Board of Directors and Vice President. Through her diplomatic and consultative style, her inclusive view of GIScience, and her strategic planning skills, Professor Ramasubramanian has positioned the organization for a successful future.